Dream Create Inspire: Happy Barkday! Here's a fun card I put together using one of my favourite techniques - paper piecing! The adorable stamps are from Paper Smooches and from the set Birthday Buddies! 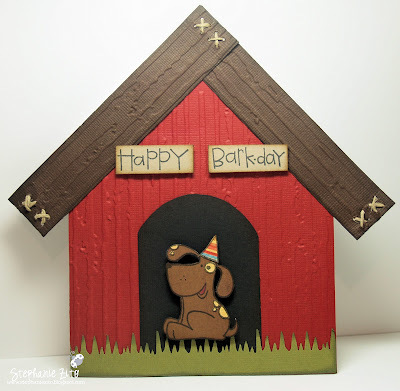 I designed the doghouse (all on my own lol) and embossed the cardstock with a Cuttlebug embossing folder. Extra products used: Bazzill cs, Basic Grey Max & Wiskers dp, MS border punch, Distress inks and twine. Inspiration for my card came from this week's challenge #155 at Cute Card Thursday and the Moxie Fab World Techniques Week Paper Piecing challenge. Too cute!! I love how you used the embossing folder. Does Butterball have a buddy to send it to? Nice design of the doghouse! Perhaps if Joe gets in trouble you can make one for him. Very nice card. I love the textures!